Anywhere you go, for dinner parties, weddings, engagements or any social gathering, people tend to fill their stomach with starters. When we were planning for my son and daughter’s weddings, we spent so much time discussing the starters and according to that it was then easy to choose the main dishes. For guests to appreciate the meal, the starters have to be the stars, then the rest just falls into place. Whenever I’m entertaining at home, and if we’re more than 10, I prefer to make starters that are easy to put together. This way I have more time to prepare the main dishes and desserts. If there’s a pot luck or bring a dish along, I usually have to prepare the starters or desserts. To have a tension free party preparation time, its best to plan. I write down the menu and the ingredients I need so that way I’m not like a headless chicken hunting for ingredients at the last minute. This also gives you the opportunity to change a dish according to the availability of the ingredients. Just a few more days were left in Montreal before hubby and I travelled back to Mombasa. That meant clearing the pantry and fridge of things my son would not use.While I was going through the fridge, I found a packet of paneer that we had bought during one of our ‘discover Indian areas in Montreal’ trip. I got excited being able to buy frozen fresh grated coconut (I so take this for granted in Mombasa) and paneer (literally jumped for joy when I saw it at an Indian grocery store). Its amazing how we don’t even give a second thought to some of the abundant ingredients we get in Kenya or India… paneer, coconut, curry leaves, fasting ingredients, tamarind, etc. This time I came to Montreal with dried curry leaves. (Not allowed to bring in any fresh fruits, veggies or plants). I layered the leaves in a microwavable plate and let it roast on high for 30-40 seconds. Though the leaves don’t remain green, the fragrance is intact. Getting back to the task at hand, with paneer in hand and not wanting to buy any fresh ingredients, a paneer curry was out of the question. I wanted to use up what was available. Out came a bottle of tandoori paste and I knew we were heading the starter way. Since I already had some naan in the freezer, I decided to make this starter. The idea came from a grilled halloumi cheese and pita bread starter I had a few days ago at a Syrian restaurant. So here’s my easy to make paneer and naan starter. And oh please do ignore the toothpicks I’ve used… a bachelor’s home has limited things and cocktail sticks are definitely not on his shopping list! Cut the paneer into approx 1″ cubes. Mix tandoori paste, yogurt, tomato paste, salt, sugar, ginger, garlic, chilli powders and oil in a bowl. Add the paneer cubes, mix gently till the paneer is coated with the tandoori mixture. Let the paneer marinate overnight in the fridge or for 4-6 hours. Line a tray with aluminium foil. Spread out the paneer cubes along with the marination sauce into the prepared tray. Bake the paneer for 30 minutes. After 15 minutes of baking, turn the paneer pieces over. Warm the naan under a broiler or grill for 3-4 minutes. Cut the naan into squares. Make sure the naan squares are about the same size as the paneer cubes. Put a folded spinach leaf on a naan square. Pick up the paneer square with a toothpick and stick it into the spinach and naan. Repeat the above step till all the paneer cubes, spinach and naan pieces have been assembled. You can use your home made tandoori paste. Make small naans at home. Cook the paneer on a tawa or pan. Such an awesome idea and I am sure these serve best as starters for a party!..cool idea.. Fantastic concept..I am loving this platter . It looks really good and will make a perfect party pleaser. I too dry the curry leaves in MW, just wipe them dry and place individual leaves on a kitchen roll , MW for 40 seconds and they are ready…they do not loose their color at all. Wow that's awesome n I love it. Wish I can eat it from the screen. Wow.. Love this bite sized appetizers.. This make a great snack and kids will sure love this treat!! That is an amazing idea to use naan in making those paneer bites. 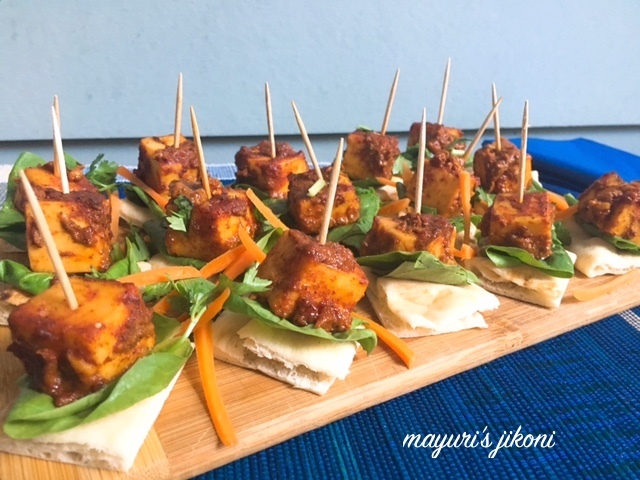 I am a big paneer fan and literally drooling over these cute bites. Nice to know about your party prep ideas. The recipe and the presentation looks very nice. The paneer looks perfectly grilled. Hi Mayuri, that's indeed a great party idea. Starters play a major role in parties and making it protein rich is such a awesome idea. Love those paneer bites. Omg, i dont mind having these ultimate bites without any fuss. Especially that paneer cubes makes too tempting and alluring. That is such a crowd-pleaser! They look so tempting and that is really an innovative idea!! Nice share Mayuri. Awesome idea and sounds so interesting.Nice party starter. Wow! I can finish off the whole platter. This looks divine. Kudos to you for making such a tempting dish with a few ingredients. Wow fantastic idea paneer bite with naan.. awesome bookmarks. awesome idea of a starter and very filling too. You are right, if the problem of starters to be served for a feast is solved; half the feast is ready!! Awesome idea for a lip smacking party starter di !